I'm not really one for new year's resolutions, but I always like to have a few goals to work toward. For example, I have a small checklist of sewing skills I'd like to acquire this year. Let's see: there's sewing a collar on a stand. And constructing sleeve plackets. And maybe even setting lapped zippers into trousers. But sitting prominently at the top of the list is "alter patterns to fit and flatter my body shape". My measurements are all over the place, meaning sewing straight from a pattern is about as futile as trying to buy off the rack. 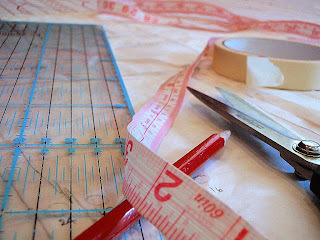 Alterations are not only desirable, but sadly necessary. It appears that one of the most important techniques I need to learn is the Full Bust Adjustment (FBA). This allows you to select the size pattern that best fits your shoulders and upper chest and then alter the pattern around the bust-line. The trouble is I am having trouble focusing on this alteration without a little blush and snicker. I don't feel I can discuss it in polite company. Its the terminology that gets me. All those high busts and apexes and the like. It sounds like we're dealing with mountain peaks ... which I guess is sort of the case when you are doing an FBA. Tee hee hee. But can I come up with anything much better? Chest Adjustment? No, no ... far too androgynous. Bodice Augmentation? Too much like plastic surgery ... as in, I am just about to do a Pamela Anderson between my side seam and centre front. How about Large Bosom Alteration? Hmm, no ... too matronly. It implies the sort of figure where a lace hanky might be poked down your ample cleavage. And frankly Putting-In-A-Dart-To-Account-For-Your-Big-Norks is not really saying bespoke tailoring to me. No, no indeed ... that just sounds uncouth. Strike that one from the record. You have me tittering in stitches... once you've worked out the FBA, I'll have to get you to start on a different FBA (Flat Bum Adjustment) for me! Hehe...I'll be *tittering* all morning. Thanks! Warm wishes for the best 2010!! I sadly have the same problem - and pregnancy really helps too - NOT! Can't wait 'til I'm breastfeeding and go up yet another size..... Lordy - they're gonna need their own postcode soon! Lara at Thornberry is the queen of the FBA. She's even been published on the topic over at Sew Mama Sew. Much prefer to hear about a good FBA than a few saftey pins holding everything together! Ha ha! I'm too scared to do a FBA, but I more probably need to do a LBA (low boobage adjustment). Your post made me laugh. Oops. Titter. Your post made me titter. Well done you had me tittering so much I jiggled, ooh that's rude ! What can I say, except....good luck with your nork adjustments! Oh, that is just a fantastic post Leisl. And I disagree, you just can't beat norks! Sewing is too staid anyway! I'm not sure 2010 is ready for me to come over all FBA. I have precisely the same ish-ews but I'm earmarking 2011 for this sort of Everest climbing (meanwhile I'm watching for some tittering top tips! ).